The restaurant served more than 500,000 people a year. New York (CNN) -- It's come to this: from filet mignon to hamburgers. Iconic Central Park restaurant Tavern on the Green is going to become a visitor center and snack bar. New York Mayor Michael Bloomberg released a statement Thursday saying that because of an impasse in negotiations between the intended new lease holder and labor unions, the city could not wait any longer to put the spot to use. The Manhattan eatery was shuttered January 1 after city officials selected a new restaurateur, Dean Poll, to operate it. That decision caused the restaurant's previous manager, the LeRoy family, to seek bankruptcy protection and begin the process of liquidating assets. While expressing disappointment that Poll and labor unions could not come to an agreement, Bloomberg says that after renovations to stabilize the building, the venue will become a visitor center, snack bar and retail shop. "We'll solicit new proposals with labor obligations from anyone that wants to reopen it as a restaurant," he said. It is expected to be a temporary facility, and no opening date or name has been determined. Attempts to contact Poll were unsuccessful. He had pledged to invest $25 million in the landmark location. Until it closed, Tavern on the Green was the second highest-grossing independently owned restaurant in the United States, generating almost $40 million from its location on the west side of Central Park. According to the New York City Department of Parks & Recreation, former Parks Commissioner Robert Moses converted the building, known as the Sheepfold, into a restaurant in 1934. 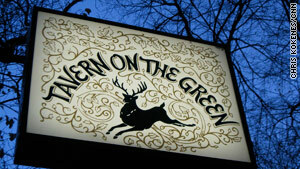 The department renamed it with the now-famous label: Tavern on the Green. A series of management companies ran the restaurant's affairs from 1934 until 1973, when noted New York restaurateur Warner LeRoy acquired the license and took control of operations. He invested $10 million in renovations of the 25,000-square-foot establishment, revitalizing the restaurant and turning it into a "popular destination for tourists and New Yorkers alike," according to the Parks Department. More than 500,000 patrons dined at the picturesque location each year.